Photo: Goethe-Institut Toronto The European Union Film Festival​ (EUFF), a not-for-profit organization, strives to reflect the excellence, innovation, and diversity of European cinema in Toronto, the world’s most multicultural city. Founded in 2004 as a salve to Hollywood monotony, this free festival has grown to now showcase dozens of contemporary films drawn from each of the EU’s member countries. The EUFF is a unique festival and the only one in the world to bring together disparate EU Consulates and local cultural institutes for collaboration. Represented countries: Austria, Belgium, Bulgaria, Croatia, Cyprus, Czech Republic, Denmark, Estonia, Finland, France, Germany, Greece, Hungary, Ireland, Italy, Latvia, Lithuania, Luxembourg, Malta, Netherlands, Poland, Portugal, Romania, Slovakia, Slovenia, Spain, Sweden, United Kingdom. TORONTO - Following a very successful and very well attended 12th edition, ​Toronto’s European Union Film Festival​ (EUFF) announced the Festival’s Audience Choice film for 2016 during the Festival’s Closing Night on November 24. Germany’s​ Head Full of Honey, directed by Til Schweiger and Lars Gmehling, earned the title. The film is a powerful bittersweet family drama on a grandfather, his unique bond with his granddaughter, and the family’s struggle to cope with his advancing Alzheimer’s. Italy’s Like ​Crazy and Denmark’s ​Silent Heart took first and second runner-up, respectively. 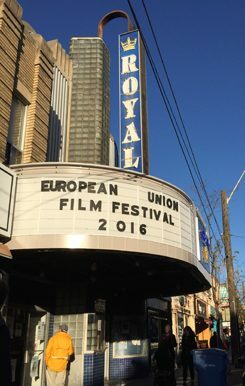 The Closing Night reception also marked the end of an extraordinary year for EUFF, during which, and for the first time, its programming included short films, a round-table discussion, and the co-presentation of two cinema-themed exhibitions. EUFF’s programming expansion will continue in 2017 with the introduction of a new screening series that will showcase classic films from EU member countries. The Classic Series ​kicks off January 29, 2017 with legendary French comedic filmmaker and actor Jacques Tati’s 1949 Jour ​de fete. The film is the story of an easily-distracted French mailman bent on making his small community’s mail delivery service ultra efficient. EUFF​’s Classic Series​ will also be FREE, including Advance Reservations, which will be available online, free of charge. Screenings will take place at the Royal Cinema, 608 College St.